What does basil downy mildew look like? Symptoms of basil downy mildew typically develop first on lower leaves, but eventually an entire plant will show symptoms. Initial symptoms include leaf yellowing (which gardeners often think is due to a nitrogen deficiency) followed by leaf browning. Affected leaves also curl and wilt, and on the undersides of the leaves, a gray-purple fuzzy material will develop. 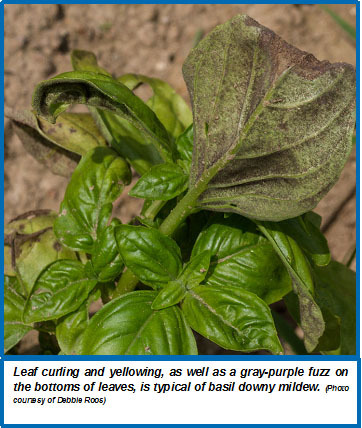 Where does basil downy mildew come from? Basil downy mildew is caused by the fungus-like organism, Peronospora belbahrii. This pathogen can be easily introduced into a garden each year via contaminated seed, on infected transplants, or via wind-borne spores (technically called sporangia). Once introduced into a garden the pathogen can spread by wind, by rain splash, or via items (e.g., hands, clothing, garden tools) that come into contact with infected plant and then are used to work with healthy plants. The pathogen thrives in humid, warm environments and can spread rapidly, decimating an entire basil crop.